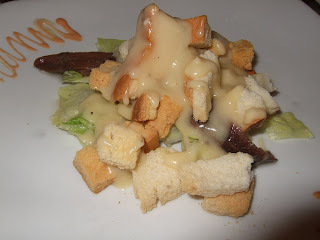 2) This Ceasar salad here was definitely more refine looking than those from other places. It was tasteful! 3) This English style “wanton skin” crisps topped with smoke Salmin looked deceivingly delicious, but in fact, the taste was so-so only. 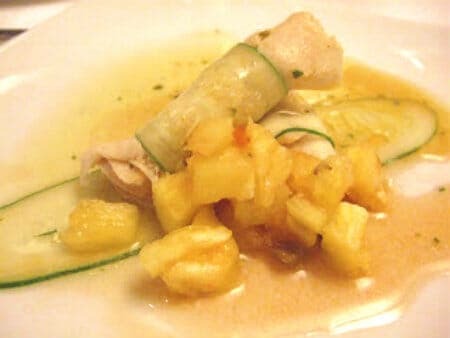 The main attraction of the dish was the fusion idea of having the crisped Asian wanton skin with Western-style smoke Salmon, didn’t forget the special cream sauce. 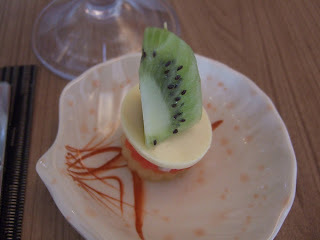 4) Another unique appetizer, with the use of tofu and fruit (Kiwi) on the dish! Its flavor could be more pungent by adding some fresh herbs and spices though. 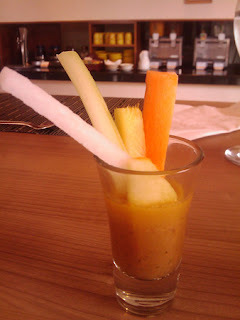 5) I personally thought this was the best and tastiest appetizer – fresh fruits and root vegetable stripes such as pineapple, carrot, turnip and celery, to go with this local specialty of Indonesia, the Satay sauce. Satay wss supposed to be a very popular local delicacy in Indonesia, their Satay sauce was so far the best. What an interesting way to eat these roots! I liked it in the small glass, too. 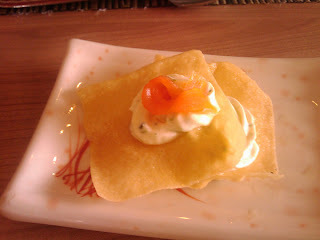 Well, I should show you their scrumptious main dishes in my next post. See you soon! ← Do you have any Question on Singapore Local Delicacies?